Millions of readers around the world are waiting for magic in their cinemas this month. Harry Potter and the Sorcerer’s Stone is the most popular book in the world today. (One hundred million Harry Potter books have sold in forty-two languages!) Now, can the film win the world’s imagination in the same way? Harry’s fans want to see a film that is exactly like the book. They already know the characters like close friends – and they love Harry’s magical world in their hearts. The British author, J.K. Rowling, wanted the film to be like the book too. ‘Why should you take a book that works so well and change it?’ she said. How can the film-makers, Warner Bros, make this unique magical world? Rowling was there to help at every stage. She worked hard to help turn her famous words into real things. Months of work and £100million later, the special effects are ready. Everyone is waiting to see their favourite characters. 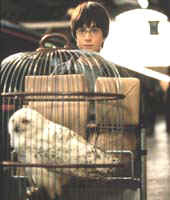 We want to see Hagrid’s frightening animals, the strange teachers, and Harry’s clever white owl. The big question is, what will the actor playing Harry be like? Sixteen thousand British and American boys auditioned for the part of Harry Potter. Rowling did not want an American to play Harry. The American director, Chris Columbus knew about Daniel Radcliffe from the BBC’s TV film David Copperfield. Columbus asked Daniel’s father to send Daniel for an audition. When Daniel walked into the room, Columbus knew. This is Harry Potter! Rowling agreed. She felt she was brought back together with a long-lost son. Ten years ago JK Rowling was a young English teacher; today she is one of the richest and most famous people in the world. Harry has helped thousands of people – young and old – to enjoy reading and he hasn’t stopped yet! Now Rowling has to turn quickly to her fifth Harry Potter book. After the film more people than ever will be waiting for Harry’s next adventure!